For this mani I painted my nails (pinkies, index fingers, thumbs) with Color Club Blossoming. 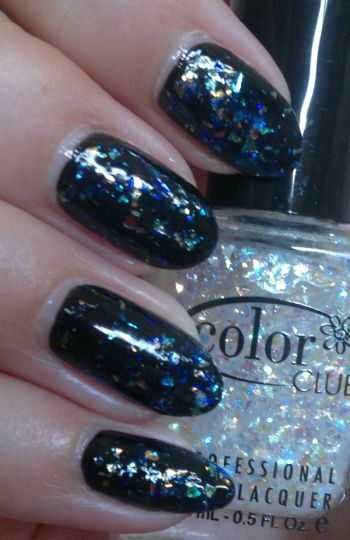 I love this polish – the colour is great, and the formula is lovely and easy to work with. Awesome stuff! I used water decals on my ring and middle fingers. The decals are on the sheerer side, so my natural nails are visible from underneath the decals. Next time I’ll make sure to paint all my nails. All in all I’m actually really happy with the mani. I also like the ‘fresh’ look of it. What do you think? Feel free to get in touch. And thanks for reading! Pueen 73 stamping plate (from Pueen’s Stamping Buffet collection). 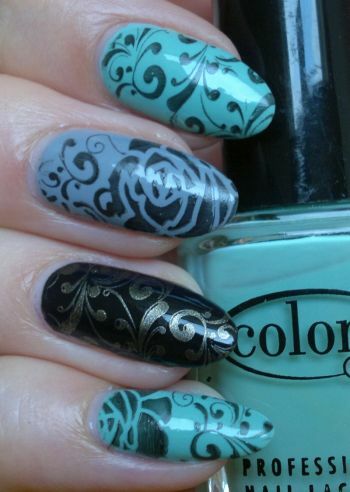 How do you like this mani? Feel free to let me know via the comments. And thanks for stopping by! Hi there! 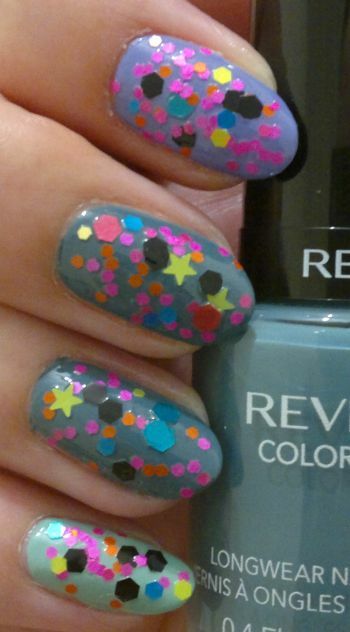 Just last week I paired Color Club‘s ultimate flakie polish, Covered In Diamonds, with a pinkish lavender shade. I knew it would be prettier on a darker base, so that’s why I used Rimmel Lasting Finish Pro 430 Black Satin as a base this time. Unfortunately the photo doesn’t capture the beauty that is Covered In Diamonds, so you have to trust me when I say that this mani looks absolutely amazing. One of the new polishes is NYC In A Minute 264 Lincoln Square Lavender. The soft lavender shade is quite pretty and I’m 100% happy with the quality of the polish (dries fast, only two coats needed). 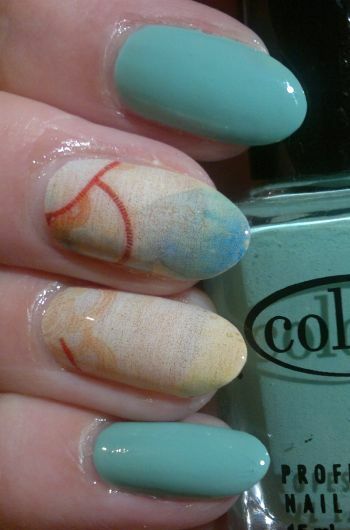 However, I get easily bored of simple manis, so I added a few flakies. I couldn’t be bothered to apply several coats of flakie topper, so I left it at one coat of Color Club’s Covered In Diamonds. Yes, I could have use a little hand lotion around the cuticles… but it’s too late now. Anyway, I really love the flakie look. It’s a lot more beautiful on darker nails, but I think it looks great on this soft lavender shade too. Hi there! At first let me apologise, I haven’t been up to much this week because I’ve got a chest infection and have coughing fits every couple of minutes. But I’m on the mend, so I’ll catch up with everyone’s posts and comments soon. In the meantime, let me show you the cute mani I did last week. I knew I wanted glitter, but I didn’t know what base colour to chose so I opted for three different ones: mint green (Color Club), greyish blue (Revlon Colorstay 280 Blue Slate) and lilac (Fashionista). The next step was choosing the right glitter. I picked a colourful glitter mix consisting of small, medium and large hex glitter in pink, yellow, orange, blue and black with lime green glitter stars. Honestly, is this the ultimate rock star glitter mix? Well, I think it definitely is!